This blog is provided courtesy of Gunter Strickert, longtime ERP trainer as well as production planning and scheduling expert. This post introduces a fictional, but nonetheless typical, production company with its typical challenges concerning the communication between the shopfloor and the backoffice/ scheduler, resulting in the everyday trouble of meeting delivery deadlines. The blog also outlines how these challenges can be mastered by using a Dynamics NAV manufacturing execution solution provided by the NETRONIC partner NAVEKSA, which seamlessly integrates the NETRONIC Gantt chart add-in Visual Production Scheduler (VPS). A pump and metering technology company. Number of employees 120, 85 of them working in production. Owner-managed in the second generation. Tuesday morning 7:00 pm: The production has been running for half an hour. The production manager and the staff member responsible for planning and shopfloor control are standing in the corridor, their heads crimson and they are having a loud argument – this is a situation often met but nevertheless unsatisfying. What is it all about? Sales had placed a both important and urgent order that, on preliminary examination of the current shopfloor orders and a reworked prioritization, had been considered and promised as possible. For this, the responsible planning person had shifted and re-prioritized other orders and production orders by using his ERP/PPS system. … but only until sales cautiously checked whether the order date “day after tomorrow” would be realized. When they learned that the order wasn’t worked on at all yet, that was the point when the heated argument started. The machine operators hadn’t (yet) received notice of the planning department’s re-prioritization because, as a rule, the work instructions (production documents) reach them only with a lead time of three days. This resulted in the written work instructions already being outdated upon production start and the workers already working on the original (before the new calculation was done) orders. And so the employees were working off their orders in good faith - orders that due to the receipt-orientation and hence the time-delay of the work instruction in fact weren’t up to date any more. In the meantime, the certified Dynamics NAV manufacturing execution add-on „SHOPFLOOR“ of the production expert NAVEKSA has been purchased and applied. This Microsoft Dynamics NAV add-on product is a MES (Manufacturing Execution System) tool supporting either fine planning of the order sequence and the voucherless assignment of activities. This means that only the unfilled orders for one day are assigned to the machine operator and, in case of order modifications as described above, the planner can withdraw even the already dispatched work instructions (voucherless to the operator’s terminal) from the operator’s active work list again. Today, after implementing NAVEKSA’s SHOPFLOOR module it is absolutely impossible to work on orders that in terms of planning are no longer up to date and so a formerly significant error potential could be eliminated. In addition to the fine planning, the planning of order sequence, and the voucherless work instructions, the NAVEKSA SHOPFLOOR system also supports the production data acquisition with all its forms and difficulty levels in the above described company. 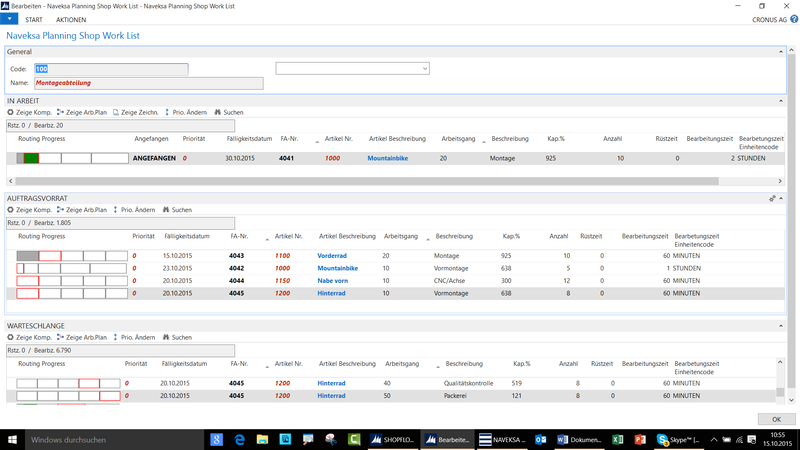 The below screenshot shows the typical screen which the operators work with day in and day out. 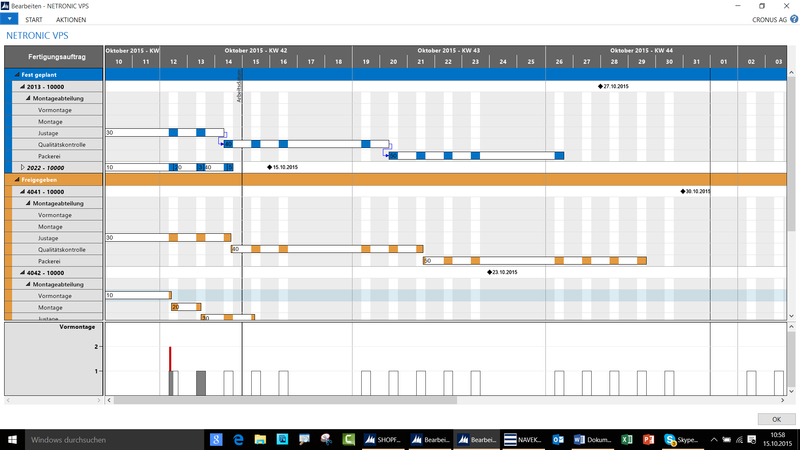 For a graphical visualization of the production schedule and also to further increase the operational agility, NAVEKSA’s SHOPFLOOR module fully integrates NETRONIC’s Visual Production Scheduler (VPS) for Microsoft Dynamics NAV, a Gantt add-in that visualizes, schedules and optimizes production orders, production order lines, operations, and capacities. The VPS enables visual production scheduling and allows users and operators to not only understand all dependencies on the shopfloor, but also to quickly react to unplanned incidents. The below screenshot shows how the VPS is applied within NAVEKSA's shoopfloor execution add-on. Practitioners will certainly agree with Gunter Strickert that while he describes a fictional company, there are certainly thousands of comparable real firms in Germany facing similiar challenges. After a thourough theoretical education, Gunter Strickert has gained more than 40 years’ experience in the fields production planning and control, MES, and, of course, ERP. For 20 years he was responsible for designing the PPS software and its implementation in the market and in the reseller channel at NAVISION and Microsoft. He has gained wide-ranging practical knowledge in design, pre-sales, sales and project work for PPS/MES and ERP software. His constant cooperation with universities, professional associations and analysts and his job as speaker at conferences and seminars make sure that his knowledge is always up to date. 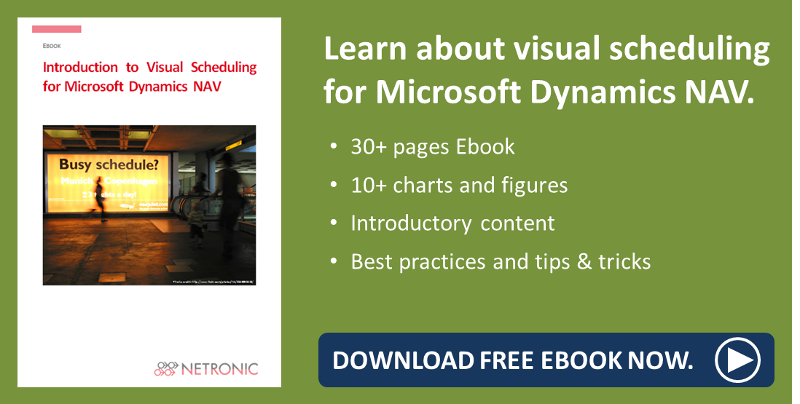 Please download the following complementary Ebook if you are interested in learning more about visual production scheduling for Microsoft Dynamics NAV.